Another John Venn was Vice-Chancellor of Oxford University 1686–1687. 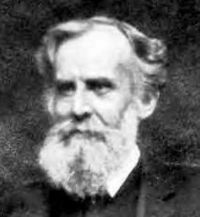 John Venn (born Hull, Yorkshire, August 4, 1834 – died Cambridge, April 4, 1923), was a British logician and philosopher, who is famous for conceiving the Venn diagrams, which are used in many fields, including set theory, probability, logic, statistics, and computer science. John Venn was born to a prominent Anglican family; his father and grandfather were both rectors in the Anglican Church. A few years after graduating from Cambridge, Venn was also ordained a priest and served in several parishes before returning to Cambridge University in 1862 as a lecturer in Moral Science, studying and teaching logic and probability theory. He published three texts on logic, The Logic of Chance (1866) which introduced the frequency interpretation of probability; Symbolic Logic (1881) which introduced the Venn diagrams; and The Principles of Empirical Logic (1899). John Venn was born at Kingston upon Hull, Yorkshire, on August 4, 1834 to a prominent Anglican family. John Venn's mother, Martha Sykes, came from Swanland near Hull, Yorkshire and died while John was still quite young. His father was the Reverend Henry Venn who, at the time of John's birth, was the rector of the parish of Drypool near Hull. Henry Venn, himself a fellow of Queens' College, Cambridge, came from a family of distinction. His father, John's grandfather, was the Reverend John Venn, rector of Clapham in south London, who became the leader of the Clapham Sect, a group of evangelical Christians centered on his church who campaigned for the prison reform and the abolition of slavery and cruel sports. Venn's father Henry also played a prominent role in the evangelical Christian movement. The Society for Missions in Africa and the East was founded by evangelical clergy of the Church of England in 1799 and in 1812 it was renamed the Church Missionary Society for Africa and the East. In 1841, when John Venn was still young, Venn's father moved to to Highgate near London in order to take up the occupation of honorary secretary to this Society. He held this position until his death in 1873. Venn began his education in London, at Sir Roger Cholmley's School, which is now known as Highgate School, and then attended the private Islington Preparatory School. As might be expected from his family background, John was strictly brought up, and there was never any thought other than that he would follow the family tradition into the priesthood. In 1853, after graduation from high school, Venn enrolled in Gonville and Caius College, in Cambridge. He was awarded a mathematics scholarship in his second year of study, and graduated as sixth Wrangler in the Mathematical Tripos of 1857, meaning that he was ranked in the sixth place out of those students who were awarded a First Class degree in mathematics. Venn graduated in 1857 with a Bachelor of the Arts degree and shortly afterward was elected a fellow of the college; he remained a Fellow for the rest of his life. Two years later, Venn was ordained a priest. The year after his graduation, in 1858, he had been ordained a deacon at Ely, and after his ordination as a priest he had served as a curate first at Cheshunt, Hertfordshire, and then for a year at Mortlake, Surrey. In 1862, he returned to Cambridge University as a lecturer in Moral Science, studying and teaching logic and probability theory. At Cambridge he found interests in common with many academics such as Todhunter. He was also responsible for the development of the Moral Sciences Tripos, lecturing and examining the Tripos and creating a friendly atmosphere between the lecturers and the students. In 1867, Venn married Susanna Carnegie Edmonstone, the daughter of the Rev. Charles Edmonstone. They had one child, a son John Archibald Venn, who became president of Queen's College, Cambridge, in 1932, and worked with his father on collaborative research projects. It had long ceased to be regarded as an anomaly for a clergyman to preach the then circumscribed evangelical creed and at the same time, without the slightest insincerity, to devote himself actively to philosophical studies; yet ... finding himself still less in sympathy with the orthodox clerical outlook, Venn availed himself of the Clerical Disabilities Act. Of a naturally speculative frame of mind, he was want to say later that, owing to subsequent change in accepted opinion regarding the Thirty-nine Articles, he could consistently have retained his orders; he remained, indeed, throughout his life a man of sincere religious conviction. Venn's interest turned towards history and in 1888 donated his large collection of books on logic to the Cambridge University Library. In 1897, he published The Biographical History of Gonville and Caius College 1349-1897. The annals of a clerical family (1904) traced the history of his own family to the seventeenth century and recorded the fact that he was the eighth generation of his family to have a university education. In 1910, he published a treatise on John Caius, one of the founders of his College. Three years later he published Early Collegiate Life, a collection of his writings describing college life in the early days of Cambridge University. With his son, John Archibald Venn, he undertook the task of compiling a history of the alumni of Cambridge University, Alumni Cantabrigienses; the first of the ten volumes was published in 1922 and the last in 1953. John Venn died in Cambridge on April 4, 1923. A stained glass window in the college commemorates his work. At Hull University, he is commemorated by the Venn Building, built in 1928. In a recent BBC poll, Venn was voted as the third greatest mathematician of modern times, narrowly beaten by Sir Isaac Newton and Leonhard Euler, who ranked first and second respectively. Venn’s other abilities and interests included a rare skill in building machines. He built a machine for bowling cricket balls which worked so well that when the Australian Cricket team visited Cambridge in 1909, Venn's machine clean bowled one of its top stars four times. His son described him thus: "Of spare build, he was throughout his life a fine walker and mountain climber, a keen botanist, and an excellent talker and linguist." 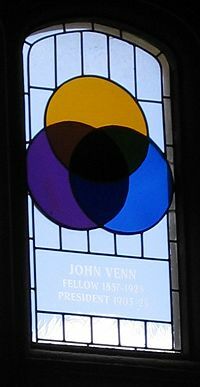 Stained glass window in the dining hall of Gonville and Caius College, Cambridge, Cambridge, commemorating John Venn and the Venn diagram. Venn's main area of interest was logic, and he published three texts on the subject. In 1866, he published The Logic of Chance, which introduced the frequency interpretation of probability; in 1881, Symbolic Logic which introduced the Venn diagrams; and in 1899, The Principles of Empirical Logic. Venn extended Boole's mathematical logic and is best known to mathematicians and logicians for his diagrammatic way of representing sets, and their unions and intersections. He considered three discs R, S, and T as typical subsets of a set U. The intersections of these discs and their complements divide U into eight non-overlapping regions, the unions of which give 256 different Boolean combinations of the original sets R, S, T.
The use of geometrical representations to illustrate syllogistic logic did not originate with Venn; Gottfried Leibniz used them consistently. Venn became critical of the methods used in the nineteenth–century diagrams of George Boole and Augustus de Morgan, and wrote Symbolic Logic mostly to present his own interpretations and corrections of Boole’s work. Prior to the publishing of this book, his fame had already been established through a paper introducing Venn diagrams, On the Diagrammatic and Mechanical Representation of Prepositions and Reasonings, which appeared in the Philosophical Magazine and Journal of Science in July of 1880. Symbolic Logic further elaborated on these diagrams, and Venn continued to improve his method for illustrating propositions by exclusive and inclusive circles. Venn's diagrams became the most consequential part of his logic trilogy, rather than his attempt to clarify what he believed to be inconsistencies and ambiguities in Boole's logic. Alumni Cantabrigienses, a biographical list of all the alumni of Cambridge compiled by Venn and his son, was a massive research project which proved invaluable to historians and genealogists. The first part contained 76,000 names and covered the period up to 1751. At the time of Venn's death, the second part, covering the period from 1751 to 1900, existed in manuscript and contained a further 60,000 names. Eden, Berna Kılıç. 1998. John Venn's evolutionary Logic of chance. Berlin: Max-Planck-Institute für Wissenschaftsgeschichte. Hennell, Michael. 1958. John Venn and the Clapham Sect. London: Lutterworth Press. Venn, John. 1962. The logic of chance. New York: Chelsea Pub. Co.
Venn, John. 1880. "On the Diagrammatic and Mechanical Representation of Propositions and Reasonings," in Dublin Philosophical Magazine and Journal of Science. 1–18. vol. 9, 59, 1880. Venn archives – Clarify the confusing timeline of the various Venns.